"A moist muffin with a brown sugar and cinnamon topping." Preheat the oven to 375 degrees F (190 degrees C). Grease and flour muffin pans, or line with paper liners. In a large bowl, stir together 2 cups flour, white sugar, baking powder and salt. Drain pineapple, reserving 1/4 cup juice. Make a well in the center of the dry ingredients, and pour in the reserved juice, egg, milk, and 1/4 cup melted butter. Mix just until blended. In a separate bowl, stir together the cinnamon, brown sugar, 1/2 cup flour, and 1/4 cup melted butter to make the topping. 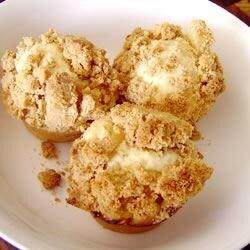 Spoon batter into muffin cups, then spoon crushed pineapple over the batter and sprinkle with the cinnamon topping. Bake for 30 minutes in the preheated oven, until a toothpick inserted in the crown of the muffin comes out clean. See how to make amazing cornbread muffins.